The record amounts of secretive Dark Money and SuperPAC spending buying elections is a direct result of the devastating Citizens United Supreme Court decision. 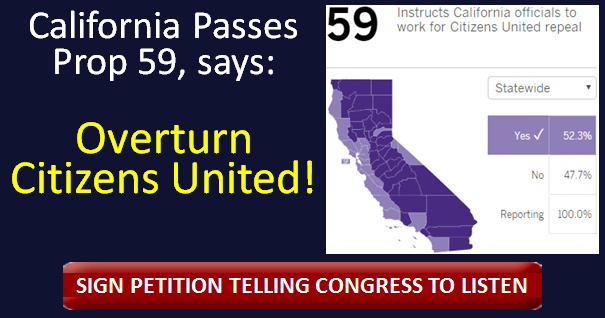 Last month, California voters sent a loud and clear message by passing Proposition 59 to instruct California's Congressmembers and legislators to propose and ratify a constitutional amendment overturning Citizens United and saying that money isn't speech and corporations aren't people! With a similar initiative also passing in Washington, four states have now passed ballot measures demanding a constitutional amendment, plus 17 states that have passed one legislatively! The campaign to get Prop 59 on the ballot and then to pass it was a truly grassroots movement. More than 150,000 people signed petitions demanding that the legislature and California Supreme Court put it on the ballot — people who then engaged in the campaign to get it passed. Thanks first and foremost go to Clean Money Champion Senator Ben Allen for authoring the bill that got Prop 59 on the ballot, as well as to our friends at Money Out Voters In who sponsored the bill. A huge coalition joined with Money Out Voters In and the California Clean Money Action Fund to pass Prop 59, including CA Common Cause, CALPIRG, American Promise, American Family Voices, Brave New Films, CA League of Conservation Voters, Courage Campaign, Daily Kos, Label GMOs: CA's Grassroots, Money Out People In, Move To Amend, Free Speech For People, Every Voice, Friends of the Earth, Our Revolution, People Demanding Action, People For the American Way, Progressive Democrats of America, Public Citizen, RootsAction, Rootstrikers, and many more. Thanks to all of you who helped pass Prop 59 by phonebanking, sharing on Facebook, engaging in Twitter Storms, writing letters to the editor, talking to people in person, telling your friends, donating, and voting. You all helped make it happen! 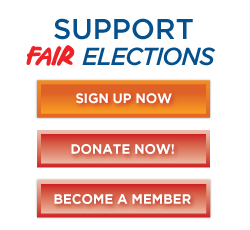 Join as a Clean Money member to help us keep scoring victories against Big Money in politics!